Welcome to the Tweeddale Rideability Group's website. The Tweeddale Group was formed in 1984 to offer riding to those living in the Tweeddale area who would benefit from the therapy, achievement and enjoyment this sport provides. In 2016 the Group changed to the status of a Scottish Charitable Incorporated Organisation and, as part of the process, it was decided to emphasise the positive approach of the Group with a new name - the Tweeddale Rideability Group SCIO. 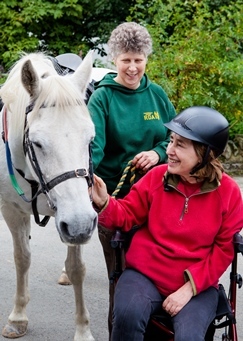 The Group remains a member group of the Riding for the Disabled Association and continues to operate under its governance, but the new name brings a modern feel to our charity where everyone has the opportunity to achieve ambitions and develop life skills. The Group relies on charitable donations to fund its activities, and is run by a team of volunteers who work tirelessly to look after the Group's five ponies, coach the riders, support riders during rides, fundraise, and so much more. Members of the Tweeddale Rideability Group are looking forward to the next chapter in its history and to inspiring others with their knowledge and enthusiasm for this exceptional sport. To find out more about us please visit our other pages, and if you're interested in supporting us in any way, or applying to become a rider then follow the links to Help Us or Apply to Ride. Like us on Facebook where there are more images and up-to-date news of the Tweeddale Rideability Group. Click here to find out what's on during the coming months. To contact us please click on a link below.